There is nothing you can do to revitalize your lawn under these dry conditions. It will not respond to fertilizer, and water alone is not enough. Grass is supposed to go dormant with this extreme heat and lack of rain. When rain returns, your grass will begin to recover. When it starts to turn green, fertilize it to strengthen the roots so it will recover faster. Be sure to use lots of mulch on your gardens to protect your plants from drought. Water plants in the morning at the base of the plants to ensure water gets to the roots. -place mulch between plants. leaving a space around stems/crowns/base of plants to prevent rotting. -vary body positions to avoid straining muscles; kneeling, squatting, bending etc., so you are not in any one position long enough to strain your muscles. -be sure to stretch well before and after gardening. Basic yoga stretches such as the downward and upward dog work well, as do planks. - apply sunscreen to any other skin exposed to the sun. -wear gloves to protect your hands from thorns, the sun, and bacteria in the soil. -stay hydrated! By the time you feel thirsty, dehydration has already set in. -wear a hat that protects your head, ears and the back of your neck. -as soon as you notice chewed or diseased leaves or flowers, take action. I use a tea tree based spray called Soluguard (see Melaleuca page in Navigation menu at right) in my garden, but there are many commercial products out there. Be sure to follow package directions carefully! My best gardening tip? 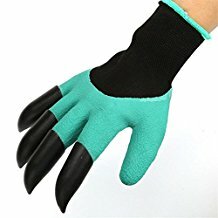 try these garden genie gloves, you will love them for planting and digging in your garden!